MACMIXDUNE chewed off the end of his cigar and spat it out. "The Badlands are full of aliens from across time and space. I shall come with you", he said. "Where are the Badlands?" I asked. "Turn left after the Nastylands, keep on past the Wickedlands. Before I was an elder I was a geography teacher", said MacMixDune chewing off more of his cigar. "If you're so smart, why do you like a McDonalds Special?" BigMacDeal shrugged and climbed into the Phantom Fighter. As I climbed in with him I noticed the loading screen was pretty. Suddenly the Phantom Fighter rushed forward at breakneck speed. It slowed down as a band of angry aliens loomed over the horizon. "Looks like Psygnosis' Menace" I said. "Sort of... I suppose". BigMacFreeDrink turned red. "It's exactly like Psygnosis' Menace, except not so good. Stuff this for a game of soldiers, I'm going back to playing Amiga Elite", I said, parachuting out of the Phantom Fighter. As I drifted down towards home I heard CheeseBurgerFrenchFries call out: "I bet it crashes on you..."
Although originality is in short supply nowadays, you can get away with ripping off games like R-Type and Nemesis without shame if you produce a game of arcade quality. Emerald Software has failed to do this. In fact if you put your nose very close to the manual you can almost smell a hot day in a Korean sweat shop. The action, if you can call it that, takes place on five horizontally and vertically scrolling screens. Upset aliens swirl around in front of you, leaving icons to give you more firepower. Since this is obviously not in their interest, why they do this is a mystery. At the end of each screen an alien, and usually the same alien, gets mad and spits more flames than a fire eater with a bad cough. How many times have you done this before? Polish and style is very important, especially in Amiga games; Phantom Fighter is suffering from a distinct lack of both. Using the system text font for the score line is pure laziness. 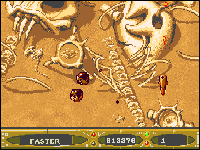 And after the first screen you'll have seen all the aliens - only the background and attack formations change. Since the main reason people stay glued to their screens is to tackle new aliens, half the fun is lost. Having said that, the backgrounds are very pretty - but the music is terrible. 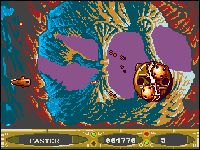 Following the dire Vixen, Martech have once again launched themselves into the Amiga market with, surprise, surprise, a progressively scrolling shoot ' em up. I won't bore you with some pseudo science-fiction scenario: suffice it to say that you pilot a horrible wobbling spaceship across alternately horizontal and vertically scrolling landscapes, facing swarms of baddies and having to defeat an end-of-level meanie before commencing battle on the next landscape. The progressive nature of the game sticks to the now-standard routine: defeating a set number of waves sees the appearance of a small icon bearing a letter. Repeatedly shooting the icon alters the letter, and hence the effect it has on the ship when collected. The additional weaponry includes: F for faster (speed up); L for laser (forward-firing only, but powerful and rapid); P for plasma (multiple shots); D for double (twice the shots for the same finger-presses); S for sides (side-lasers); and H for homing (missiles - speaks for itself really). These are all pretty effective in their own way - except for the homing missiles, which are fine until you reach the end- of-level meanie, at which point they stop homing and become completely useless. Phantom Fighter also has one or two major drawbacks. First (and most importantly), it's very, very hard. And it's hard for the wrong reasons: you are frequently called upon to have superhuman reactions (play is all too often accompanied by the cry, 'What hit me!?'). Aliens force you into one area of the screen and then bombard you with missiles, or they rapidly appear from the edge of the screen nearest to your ship, giving zero change of avoiding them. Secondly, there isn't enough variety. OK the screen scrolls vertically and horizontally but the backgrounds are pretty much static and the attack waves are hardly the most unusual or innovative. Also, the end-of-level meanies are your average spinning, missile-gobbing end-of-level meanies. No surprises there. Finally, each level is loaded in separately - and takes 30 seconds. Doesn't sound too much, does it? OK, play your favourite shoot ' em up. Wait half-a-minute between levels and see how long it takes before you start fidgeting. That's about it really - if you want an average, frustrating shoot ' em up, then look no further. But then, you don't REALLY want that, do you?